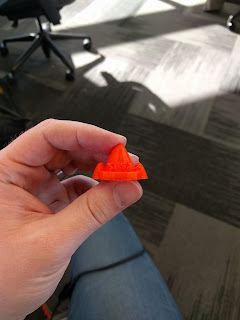 Yesterday, I designed this little spaceship thingy in TinkerCAD and printed it at the AADL on a Printrbot! It was two parabolic cones on either side of a third, larger parabolic cone, with a ring going around. It also says NASA on the side, but the resolution of the printer wasn't quite high enough to work at that scale, so it mostly says "\AS/". You can download my .stl file here. Use at your own risk, no warranty etc. etc.